Martyn Worms of Camberley International tells me of a price reduction in another of his central agencies as the 43.5m motor yacht Latitude, due to start sea trials in January 2010, drops by €1 million. Built by Dutch Yacht Builders in aluminium to a Cor D. Rover design, she's ABS classed and MCA compliant, accommodating 12 guests in six staterooms including an on-deck master. 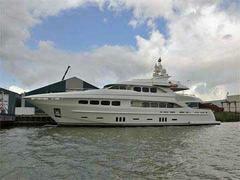 With a projected cruising speed of 18 knots, Latitude is now asking €17.5 million.